That’s right, the two eldest Higgins offspring start school in the morning. We are very excited. Okay, some of us are also a little sad, but mostly we are excited. This is the first time I will be involved in a classroom (not counting junior college…and that was in the hood, so really a completely different sort of experience) since I was seven. SEVEN. I think I’m more nervous than either of the kids. For those of you that don’t know (and care), we’ve been teaching Maggie (and Cal a teeny bit) at home, doing our best to give them a classical Christian education. For a variety of reasons (that I may or may not blog about at some point), we have realized that it’s time for them to be in a day school. The quick summation is this – we are fully convinced that a classical Christian education is what is best for the Higgins family and it is basically absurd for us to keep trying to do that on the homefront. It’s really, really hard. And only going to get harder. Like I said, maybe I can expand on that later. Providence Classical Christian School has been fantastic so far and we are really looking forward to the year ahead. If you think of it, pray for us as we get adjusted in the next few weeks. We want to be faithful in directing and participating in our kids’ education while we delegate to other faithful believers who are well equipped and experienced. Oh, and have you all seen (americanized) bento lunches?! So much fun, and all in a plastic box. And don’t get me started on school supplies. 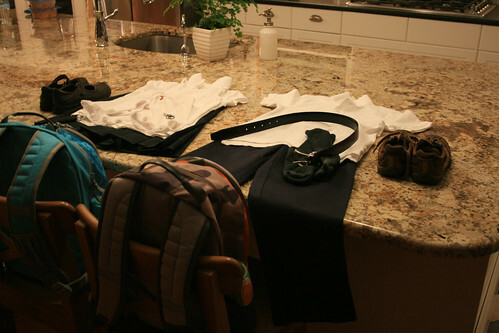 I think I’ve sorted and packed their backpacks four or five different times. You’re awesome!! I’m so proud of you! 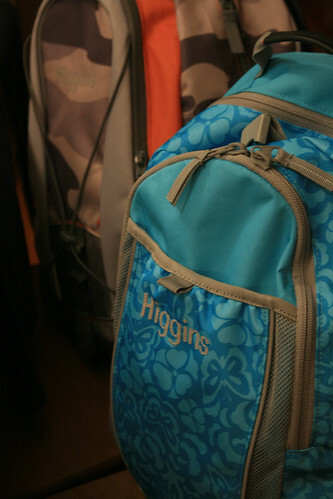 I love how you put “Higgins” on the backpack! Did you sew that on? Oh gosh, I just saw these comments! No, no sewing for me. It’s all Land’s End. Love them.